Protect your ears at sports games or other loud events with Howard Leight's NRR 22 Impact Sport Ear Muff. Impact Sport Electronic Earmuffs provide protection from damaging noises over 82 dB, while amplifying regular ambient sounds such as conversation, range commands, etc. Protect your ears at sports games or other loud events with Howard Leight &apos;s NRR 22 Impact Sport Ear Muff. Impact Sport Electronic Earmuffs provide protection from damaging noises over 82 dB, while amplifying regular ambient sounds such as conversation, range commands, etc. Features include a ventilated inner headband to minimize pressure on the head, durable outer headband to withstand abuse, snap-in ear cushions, directional stereo microphones, Quick-Click headband height adjustment and an NRR of 22 dB. Amplifies ambient sound to safe 82 dB response technology revert to passive hearing protector when noise reaches 82 dB. Non-deforming outer headband withstands rough treatment in the toughest workplaces. Low-profile design with cut-out allows for full clearance of firearm stock, eliminating interference while shooting. 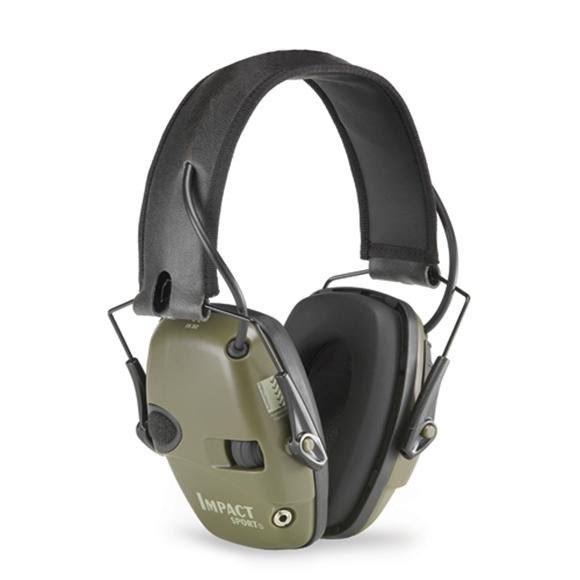 Khaki colored earcups ensure uniformity with camouflage outfit if necessary. Features Bilsom Technology&apos;s patented Air Flow Control technology for optimal attenuation across all frequencies. AUX input allows connection to external MP3 players or other audio devices for additional listening off the field.